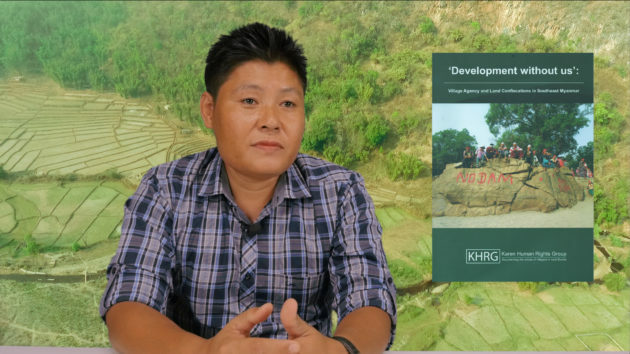 In an exclusive interview with Karen News, Saw Albert, Field Director of Karen Human Right Group (KHRG), talk about the land confiscation and its impact on the livelihood of villagers, as well as the unfavorable conditions of legal mechanism towards villagers to secure their lands. Land confiscation is serious because 70% of the population in south east Myanmar depend for their livelihood on land. Land confiscation is very serious. Research shows that the peace process does not support or does not help secure civilians’ lands. Mostly, the information we have received [that the peace process] is opening up space for business activities, business ventures, activities that take villagers’ lands. Also, adding to that, villagers do not have land registration documents, as villagers had been running from conflicts for many years. They don’t have time or access to land registration. It is not available for them during the conflict time. And when the ceasefire came, they were not ready and there was not enough time for them to do land registration to secure their land and protect their lands from being confiscated for business. Land registration is difficult overall for the community to access, depending on the area. For example, if the community is under the KNU control, they can easily access land registration via the KNU. But communities under both KNU control and the government, it can be difficult for them to register. The first part is access to land registration. The other is parallel land policy. Usually, the KNU would come and do the land registration for the community, but the government does not allow it. On the other hand, government policy or the 2008 constitutions and 2014 land use policy, the government only uses those policies and the community does not have ownership. So when the villagers apply for it, it takes time to get registration documents. There is lots of corruption during the process. We can say that it is not easy for the community living under government control or in mixed control areas to get land registration documents to secure their land. After the preliminary ceasefire and nationwide ceasefire agreement, what we see is there is a lot of land confiscation information [complaints] that we have received. Mostly we can see that the Tatmadaw, the military, is confiscating lands. They have been confiscating since conflict times. But some are in the new area. Another one is the government who is confiscating lands. Others are the ethnic armed groups, business actors and local authorities from both government and ethnic armed groups. They are those who confiscate lands and use those lands for their business activities which are the so-called development projects. The complaint process from the community, civilian, and villagers are quite effective, but what is not effective are the responses from authorities or government. So now when the lands are confiscated, the villagers organize themselves, write complaint letters, and send them step-by-step. The only thing that is not effective or proactive is the government’s response to the community complaints. Overall, we can say the complaint process that is available to the community is effective, but solving the community [problems] are not effective. After the land has been confiscated, the community try their best and look for possible ways and solutions to get back their land – approaching KNU, approaching the government, approaching the local authorities or approaching CSO/CBOs for support to be able to get their land back. Most young people have migrated to other countries or to towns to look for income and to support their families back in the village. Some people have lost their cultivated lands and even their places [homes] to stay. Some people received some compensation which is not ……. enough to restart their lives. You can see that it is very difficult. When development projects come in, there are lots of business activity. Drug problems follow the development projects. It destroys their traditional lives. It is sad to see that in the past Karen people were famous for their hospitality. Nowadays, you do not see that much anymore. Our culture and tradition have started to disappear. Business and development projects are good, but they should support people’s growth, and reduce poverty. But currently, businesses that are happening in our area are increasing poverty in the community. It only benefits a small number of people and brings poverty to the larger population. When we complain about the business and development projects coming into our Karen area, it doesn’t mean the Karen people do not want the developments. We want sustainable development projects in our area that are not just about profits. A sustainable development project will support building the community, not destroying the community. Land confiscation is because a lot of the business and development projects that come in are taking land. Every time a community goes to have consultation or negotiation with the authorities (after land confiscation happened), they come back without compensation. Mostly, they are questioned to show their ownership document to prove that they own land, but the communities were unable to get the documents during the conflicts. As soon as the peace process comes, the development projects come in and there is no time for them [the villagers]. They should prepare sustainable development projects that are transparent and acceptable to the community. The national government, local authorities, and ethnic armed groups should make it easier for the community to be able to access information related to land and land registration. The second is harmonizing the policy. The community does not have enough information on which policy or law guarantees them, (for example the government has ‘land use title’ and KNU has ‘ownership title’). Is it guaranteed for them? We recommend that both the KNU and government’s land policies should be harmonized so that it will make it easier for the community to registration land.